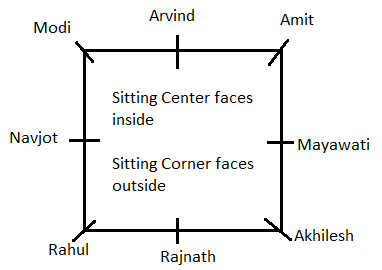 Akhilesh, Modi, Rahul, Amit, Mayawati, Arvind, Rajnath and Navjot are sitting around a square table in such a way that four of them sit at four corners of the square table while four sit in the middle of each of the four sides. The ones who sit at the four corners face outside while those who sit in the middle of the sides face the centre of the table. Amit sits third to the right of Rajnath. Rajnath faces the centre. Mayawati sits third to the left of Rahul. Rahul does not sit in the middle of the sides. Only one person sits between Mayawati and Arvind. Arvind is not an immediate neighbour of Rahul. Navjot faces the centre. Akhilesh is not an immediate neighbour of Arvind. 1. What is the position of Rahul with respect of Modi? 2. Who sits exactly between Mayawati and Arvind? 3. Which of the following pairs represents the persons seated in the middle of the sides and are facing each other? 4. Who among the following sits/sit between Arvind and Akhilesh when counted in anti-clockwise direction from Akhilesh? 5. If Akhilesh is made to face the opposite direction, who would sit to his immediate right ? There is an eight-member committee heading a housing society, There are four sectors- I, II, III and IV. Two members represent each sector. 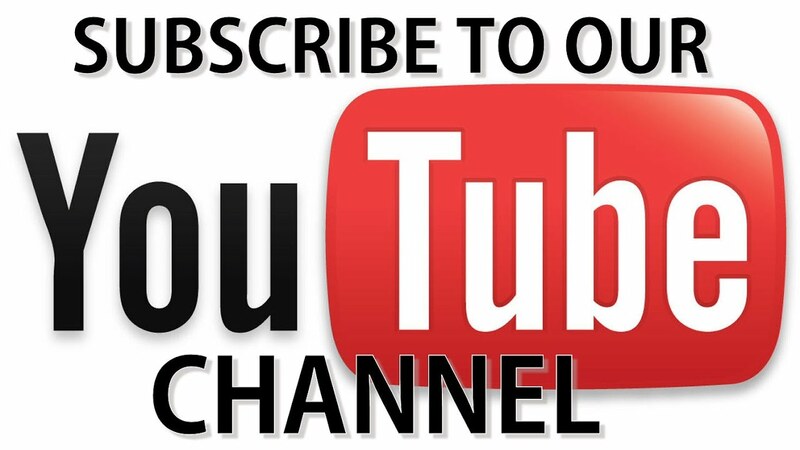 The members are- Manoj, Sonal, Om, Prakash, Rajkumar, Rahul, Prem and Lokesh. The names of the members are not necessarily in the same order as the names of the sector. The members are from different professions. Those professions are – Housewife, Cricketer, Lawyer, Director, Professor, Nurse, Singer, and Engineer. During a conference the members sat around a table facing towards centre of the table. Now study some additional clues before answering questions. (i) No two representatives of the same sector are sitting adjacent to each other except those of sector II. Representatives of sector I are sitting opposite to each other. (ii) The Director is sitting on the immediate left of the Engineer. Rajkumar is neither the Engineer nor the Lawyer. (iii) Lokesh, the Nurse, represents sector III. She is sitting on the immediate left of Sonal, who represents sector II. Mrs. Sonal is not the Lawyer. (iv) Professor Rahul is neither from sector I nor from III nor IV. He is sitting opposite Prem. Only Cricketer Manoj is sitting between Director Prem and the Singer. (v) Both the representatives of sector IV are sitting adjacent to representatives of sector I. 6. Who is the Housewife? 7. Which of the following statement is false ? I. The Cricketer is sitting opposite the Housewife. II. The Professor is sitting opposite the Director. III. Prakash and Om are sitting opposite each other. IV. The two females are sitting adjacent to each other. 8. What is the profession of Om? 9. Who among the following represent sector I? 10. Who is sitting opposite the Nurse ? Directions (11 – 12): Each question consists of four statements followed by five conclusions. Consider the given statements to be true even if they seem to be at variance with commonly known facts. Read all the conclusions and then decide which of the given conclusions does not logically follow from the given statements using all statements together and mark that conclusion as your answer. a) Some bananas are mangoes. b) Some mangoes are oranges. c) No apple is a orange. d) All mangoes are bananas. e) Some grapes are bananas. a) All papers being pen is a possibility. b) Some pens are pencils. c) Some papers are books. d) Some crystals are papers. e) Some pens are books. 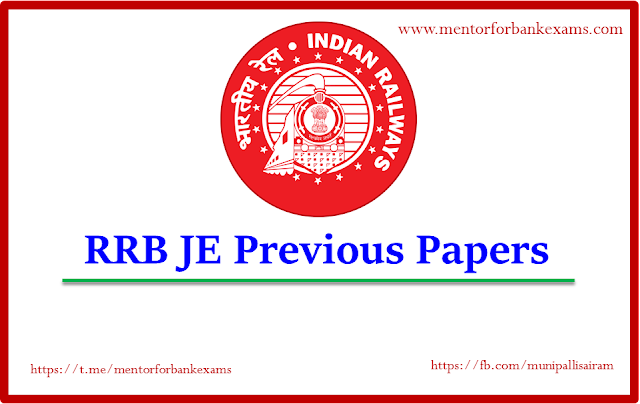 Directions (13 – 14): In each of the questions given below three statements are followed by two conclusions numbered I and II. You have to take the given statements to be true even if they seem to be at variance with commonly known facts. Read the entire conclusion and then decided which of the given conclusions logically follows from the given statements, disregarding commonly known facts. Give answer. e) If both conclusion I and II follow. No toy is a tree. I. All trees being tough is a possibility. II. All trains being toys is possibility. I. No book is light. II. All books being road is a possibility. 11. B) Option A: Some bananas are mangoes. All mangoes are apples (A) + All apples are bananas (A) = A + A = A = All mangoes are bananas – Conversion – Some bananas are mangoes (I). Hence option A evidently follows. Option B: Some mangoes are oranges. All mangoes are apples (A) + Converse of 'No orange is apple' – All mangoes are apples + No apple is orange (E) = A + E = E = No mango is orange. Hence option B does not follow. 12. C) Option A: All papers being pen is a possibility. Some pens are papers – conversion – Some papers are pens. Hence All papers being pen is a possibility. Option A thus follows. Option B: Some pens are pencils. All pencils are pens – conversion – Some pens are pencils. Hence option B follows as well. Option C: Some papers are books. We can't deduce a definite relationship between the classes 'papers' and 'books' because the middle terms 'pens' is not distributed in either statement (i) or statement (ii). Option C hence doesn't follow. We need not check the other options now as we have already got the conclusion which doesn't follow. Option C is hence the correct answer. 13. A) Some toys are tough (I) + conversion of 'No toy is a tree' – No tree is a toy (E) + = I + E = O = Some tough are not trees (O). Thus, there is possibility that ‘All trees are tough’. Hence, conclusion I follows. Again, No toy is a tree (E) + All trees are trains (A) = E + A = O* = Some trains are not toys. So, 'All trains can never be toys'. Hence, conclusion II does not follow. 14. B) All lamps are roads (A) + No road is light (E) = A + E = No lamp is light. No lamp is light (E) + No book is lamp (E) = E + E = No conclusion follows. Hence, conclusion I does not follow. Again, Some road are lamp (I) + No lamp is a book (E) = I + E = O = Some roads are not books. But, as we are not sure of the distribution of the class 'books', 'All books being road is a possibility'. So, only conclusion II follows.